Standard Zhuang (autonym: Vahcuengh (pre-1982: Vaƅcueŋƅ; Sawndip: 话壮); simplified Chinese: 壮语; traditional Chinese: 壯語; pinyin: Zhuàngyǔ) is the official standardized form of the Zhuang languages, which are a branch of the Northern Tai languages. Its pronunciation is based on that of the Yongbei Zhuang dialect of Shuangqiao, Guangxi in Wuming District, Guangxi with some influence from Fuliang, also in Wuming District, while its vocabulary is based mainly on northern dialects. The official standard covers both spoken and written Zhuang. It is the national standard of the Zhuang languages, though in Yunnan a local standard is used. The sentence Son mwngz hwnj max gvaq dah (Son mɯŋƨ hɯnз maч gvaƽ daƅ) "Teach thee to climb on a horse to cross a river" is often used to help people remember the six tones. Standard Zhuang is an artificial mixture of several Zhuang languages. The lexicon is based almost entirely on various Northern Zhuang dialects. The phonology is essentially that of Shuangqiao, with the addition of ny, ei, ou from Fuliang, both located in Wuming County. Zhang (1999), along with other Chinese scholars, classifies Shuangqiao dialect as Northern Tai (Northern Zhuang). Shuangqiao was chosen for the standard pronunciation in the 1950s because it was considered to be Northern Zhuang but with characteristics of Southern Zhuang. Standard Zhuang is used most frequently in domains where written Zhuang was previously seldom used, such as newspapers, translations of communist literature and prose. It is one of the official languages of China that appears on bank notes; all Chinese laws must be published in it, and it is used for bilingual signs. Whilst used for adult literacy programs, it is currently only taught in a very small percent of primary and secondary schools in Zhuang-speaking areas. In less formal domains the traditional writing system Sawndip is more often used and for folk songs Sawndip remains the predominant genre with most standard Zhuang versions being based on Sawndip versions. In 2012 the first Zhuang Proficiency Test took place which 328 people took and 58% passed. In 1957 the People's Republic of China introduced an alphabetical script for the newly standardized Zhuang language. The alphabet included a mixture of Latin, modified Cyrillic and IPA letters. A reform in 1982 replaced both the Cyrillic and IPA letters with Latin letters to facilitate printing and computer use. These alphabetical scripts are part of Standard Zhuang. The Old Zhuang script, Sawndip, is a Chinese character–based writing system, similar to Vietnamese chữ nôm. Some Sawndip logograms were borrowed directly from Chinese, while others were created from the existing components of Chinese characters. Sawndip has been used for over one thousand years for various Zhuang dialects. 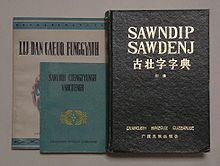 Unlike Chinese, Sawndip has never been standardized, and authors may differ in their choices of characters or spelling, and it is not currently part of the official writing system. First article of the Declaration of Human Rights. Bouч bouч ma dəŋƨ laзƃɯn couƅ miƨ cɯyouƨ, cinƅyenƨ cəuƽ genƨli bouчbouч biŋƨdəŋз. Gyɵŋƽ vunƨ miƨ liзsiŋ cəuƽ lieŋƨsim, ɯŋdaŋ daiƅ gyɵŋƽ de lumз beiчnueŋч ityieŋƅ. Boux boux ma daengz lajmbwn couh miz cwyouz, cinhyenz caeuq genzli bouxboux bingzdaengj. Gyoengq vunz miz lijsing caeuq liengzsim, wngdang daih gyoengq de lumj beixnuengx ityiengh. All human beings are born free and equal in dignity and rights. They are endowed with reason and conscience and should act towards one another in a spirit of brotherhood. ^ "广西区直有关单位机构名称英文参考译法". Retrieved July 3, 2015. ^ "壮语拼音方案（一）". Wszhuangzu.cn. Retrieved April 6, 2012. ^ "壮语拼音方案（二）". Wszhuangzu.cn. Retrieved April 6, 2012. ^ 张均如 / Zhang Junru, et al. 壮语方言研究 / Zhuang yu fang yan yan jiu [A Study of Zhuang dialects]. Chengdu: 四川民族出版社 / Sichuan min zu chu ban she, 1999. ^ Minglang Zhou, Multilingualism in China: the politics of writing reforms for minority languages 1949-2002 (Berlin, Mouton de Gruyter 2003), ISBN 3-11-017896-6, pp. 251–258.